Essential oils are natural compounds extracted from plants and herbs with powerful medicinal properties. They are commonly used in aromatherapy, and as a natural approach of improving your mental, physical and spiritual health. These oils have been used in the treatment of various ailments for centuries. They’ve also been used for relaxation, skin care, cleaning and as natural remedies. Most essential oils have antibacterial and antiseptic properties, which means they’re ideal against fungi, bacteria, viruses and various infections. In fact, essential oils may be the best natural option against bacterial infections. They can fight off bacteria without any adverse side-effects and can even kill superbugs which are antibiotic-resistant. Each essential oil also has its own characteristics and therapeutic properties. The tea tree oil has potent antibacterial, antiviral and antimicrobial properties. Unlike other oils, it can be applied to the skin without being diluted first. Tea tree oil has been used as treatment against acne, psoriasis and eczema, while Aborigines used it to accelerate the healing of wounds. The oil is derived from the Melaleuca tree and is native to Australia where it has been used for a long time. Although it was used frequently in the past, scientists found out about the oil’s antibacterial properties later on. 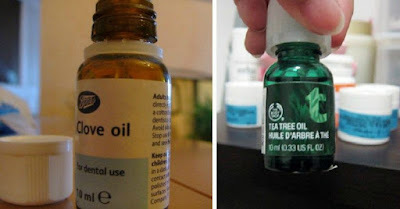 Tea tree oil can defeat almost any kind of bacteria and is great for preventing infections on open wounds. The oil can also eliminate infections. And the benefits of tea tree oil don’t stop there – used in a diffuser or nebulizer, it can relieve stuffy nose or chest congestion and reduce the symptoms of colds and the flu. Steam inhalation of the oil can destroy bacteria in the nasal passage and has a positive effect on your respiratory tract. Thanks to the oil’s antifungal properties, it can also be used to eliminate infections such as Athlete’s foot. Besides adding a nice flavor to meals and dishes, the oregano oil has antibiotic, antiviral and antifungal properties which work great against skin infections. The oil can even destroy dangerous bacteria such as Staphylococcus, and has anti-inflammatory properties as well. According to a 2001 study, the oregano oil is just as powerful as any conventional antibiotic, and is commonly used against nail fungal infections. To relieve infections such as Athlete’s foot, pour hot water in a tub, add a few drops of oregano oil in and soak your feet for 20 minutes. Steam inhalation of the oil is great for bacterial infections in the respiratory tract. According to a study from the Loyola College, cinnamon oil may actually be the most powerful antibacterial oil that exists. The study has shown that it can fight bacteria such as E. Coli, Klebsiella, Bacillus subtilis, Staphylococcus Aureus and Pseudomonas aeruginosin. The study showed that cinnamon oil works better than clove, orange, lemon, lime and geranium oil and is also better than conventional antibiotics. The oil managed to kill the bacteria after only a week or two, and has also proven as an effective remedy against pain caused by a root canal. Use the oil to prepare a homemade paste and brush your teeth with it to kill all bacteria in the oral cavity. Clove oil is definitely one of the most powerful antibacterial oils. It has been used as a natural toothache remedy for centuries thanks to the presence of a compound known as eugenol. Clove can fight bacteria such as E. Coli, and can also be topically applied on the skin to treat problems such as acne or warts. Studies have shown that grapefruit oil is just as effective as various antibacterial creams and can be used against a variety of infections. The oil has proven itself effective against a number of dangerous bacteria and has antimicrobial properties as well, which make it a great disinfectant. Grapefruit oil can kill bacteria in your kidneys and gut, and can also boost your endocrine system function and stimulate the production of bile. The lemongrass oil can prevent the growth of bacteria inside and out. It can also treat most skin disorders, bacterial infections and body odor as well. However, before using it, you must dilute it with a carrier oil such as jojoba, coconut or olive oil. You can use lemongrass oil to relieve headaches by massaging your temples with it. Rubbing the oil on your sore muscles should relieve the pain. Thyme oil has been used as a natural antibacterial agent for centuries. The herb is highly effective against a number of bacteria including salmonella. People often use it against respiratory infections or chest congestion as well as a natural detox treatment. Thyme can also fight off most inflammatory conditions and alleviate the symptoms of menopause and PMS. Finally, the bergamot oil has been known to fight and prevent infections including dangerous ones such as meningitis, UTIs and endocarditis. The oil can assist in the treatment of mouth ulcers and canker sores as well as the prevention of acne breakouts. Before rubbing it on your skin, however, it should be diluted with a carrier oil.